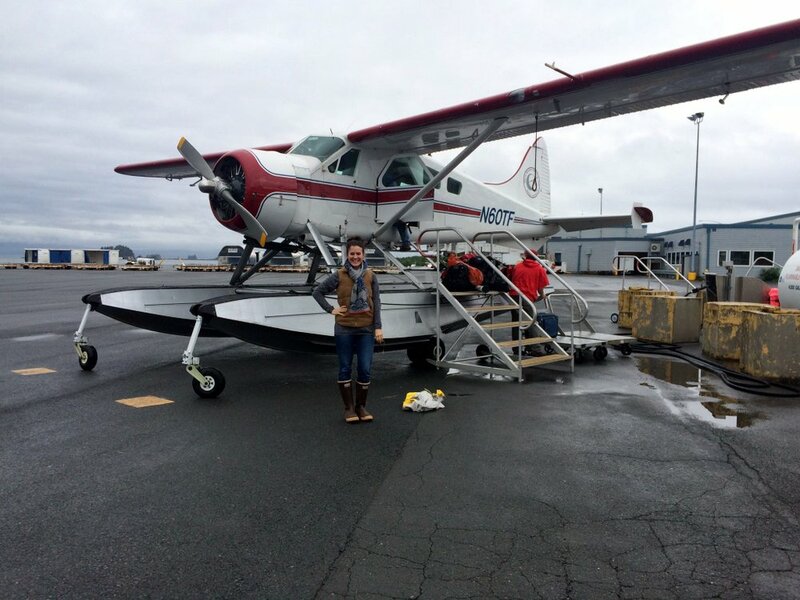 2017-18 fellow Katherine Rose prepares for the float plane trip to Baranof Warm Springs. She covered the opening of the Alaska Whale Foundation’s new field station there. Raven Radio’s post-graduate fellowship is a 30-week program intended to bridge the period between the completion of a journalism student’s education and the beginning of his or her career. — Gain substantial expertise in a professional newsroom. — Refine live broadcast and production skills. — Experiment with and develop multi-media production skills. — Explore complex news issues in a diverse community, region, and state. — Write, edit, and produce sound-rich, in-depth stories for local, state, and national distribution. — Establish professional connections to NPR, the Alaska Public Radio Network, National Native News, and other affiliates. A candidate for the Raven Radio Post-Graduate Fellowship has completed an undergraduate or graduate degree program in journalism (or a related field of study) and has acquired competency in news writing, broadcast journalism, or multimedia production at the academic level, in an internship, or as a freelancer. Someone with an M.A. in Journalism looking to create a professional portfolio and to establish contacts within public broadcasting is a candidate; a college graduate with no prior experience who may be thinking about going into journalism is not. On the other hand, an established print reporter hoping to transition into broadcast would be considered for the Fellowship. Bottom line: If you’ve chosen broadcast journalism as a career and have demonstrable skills, you’re eligible to apply. 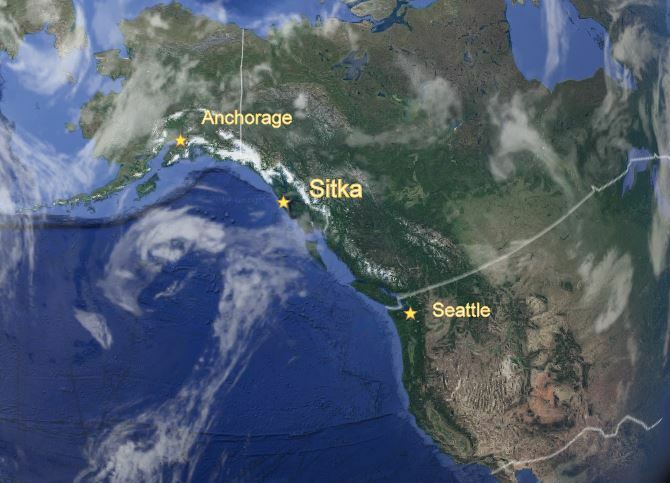 Sitka is halfway between Seattle and Anchorage — about a 2-hour flight from either city. The mid-winter break is optional. The Fellow may work any 30-weeks between the approximate start and end dates. The Fellow will be covered by the station’s workman’s compensation policy, but no other insurance benefit is provided. The stipend is paid only for weeks worked – there is no paid leave. Raven Radio will cover some travel costs to/from Sitka (see “Transportation” below). The fellow has exclusive use of a small studio apartment within walking/biking distance to downtown Sitka and the station. A bike and helmet are also provided. Additionally, Raven Radio will provide airfare, lodging, and per diem for the Fellow to attend the annual meeting of the Alaska Press Club in April 2019. The Raven Radio Post-Graduate Fellow, after an initial training period, becomes our colleague in the news department. We work a 40-hour week, often in the evenings and sometimes in the early morning. We share news hosting duties on three 12-minute newscast each weekday. We file stories as often as we can, and post to our regional FTP site, the KCAW website, Facebook, YouTube, and Twitter. The Fellow – like all members of the news department – observes the ethical standards of the Society of Professional Journalists (SPJ). In a small community like Sitka, protecting the station’s reputation for objective, open-handed reporting is paramount. Raven Radio will cover the Fellow’s round trip airfare between Sitka and any US airport served by Alaska Airlines. Sitka is located on Baranof Island in Southeast Alaska, about 2 hours by air from Seattle. There is no road access from the continental United States. VII – Why Train at KCAW? The Fellowship is modeled on Raven Radio’s summer internship program for journalism graduate students. Both programs take talented students from a demanding academic culture, drop them into a fertile news environment, and add mentoring and structure (deadlines!). 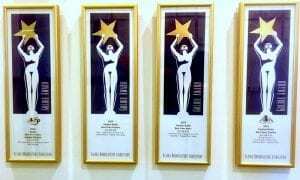 The internship program is now in its second decade; eight of the last nine interns have all won state broadcasting awards. KCAW’s 2012 intern, Rachel Waldholz, won for this piece about the Tenakee Bath House. While the KCAW internship is about training, the Fellowship is about opportunity. 2017-18 Fellow Katherine Rose broke boundaries by becoming the first former KCAW Summer News Intern to win the Fellowship. Katherine did solid beat work over her tenure, but she also owned the quirky story that no one else even dreamed of: How about Fantasy Mushing in our Iditarod-obsessed state? But her tour de force was not classic reporting at all, instead it was her eight-episode podcast “Sitka Platters,” in which she explored Sitka’s food culture (and playfully jabbed at Sitka’s gossipy Facebook page “Sitka Chatters”). Katherine still lives in Sitka, working as a freelance podcast producer and interim KCAW reporter. She’d be happy to discuss her experience in the Fellowship. You can reach her at katherine-at-kcaw.org. Our 2016-17 Fellow, Emily Russell, came to Sitka after a year at KNOM in Nome, where she developed a lasting love for Alaska. Emily’s interest in culture and politics took her some unexpected places, as in this profile of Alyssa London, the first Tlingit to win the Miss Alaska pageant. Emily filed dozens of hard stories for the KCAW newscasts, but she’ll be remembered for her light touch, like when she attempted to fly across the country with a jar of live sourdough starter. Emily also pioneered a local version of Storycorps, when she connected two generations of women fishermen to discuss their lives in this tough industry. You can connect with Emily Russell via email at russellemilyc-at-gmail.com for her perspective on the fellowship. It’s not all about conventional journalism. 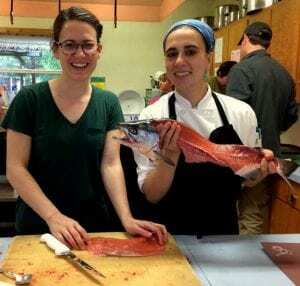 In addition to her beat work, 2017 Katherine Rose (l.) launched a podcast “Sitka Platters” exploring Sitka’s food culture. Here she’s filleting at salmon with local chef Renee Trafton. Emily Kwong is now KCAW’s full-time reporter, covering local government, economy, and culture. You can email her at emily-at-kcaw.org for her insights on life as a KCAW fellow. Occasionally, a fellow’s work goes nationwide. Our 2013-14 Fellow, Emily Forman, produced this story about airport safety for NPR’s Morning Edition. 2014 – Emily Kwong – KCAW reporter, now a fellow with NPR’s John Alexander Project reporting on climate migration in Mongolia. — Expanded news coverage in the fall-winter-spring months. A broader variety of stories, many of them more in-depth than typical daily news stories. — A diversity of voices providing the news. — Improved coverage of our remote listening communities. — Greater flexibility to work with NPR West on repackaging local and regional stories for national newscasts (see an example here). — An overall higher level of reporting due to the expanded network of news sources and relationships that the Fellow develops over time. 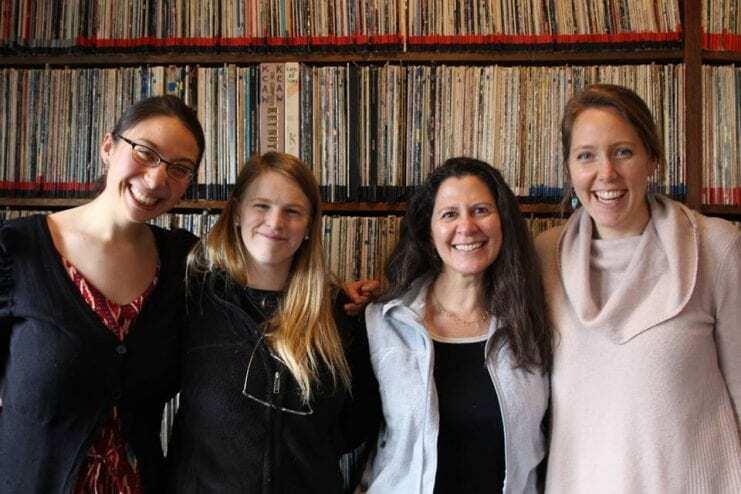 KCAW reporter Emily Kwong (l.) with NPR producer Elissa Nadwormy, NPR reporter/host Melissa Block, and 2016-17 Fellow Emily Russell. Although the fellowship provides an expense-paid trip to the annual meeting of the Alaska Press Club, networking opportunities often show up on KCAW’s doorstep. In this case, Melissa Block was in Southeast Alaska working on her series “Our Land.” Block and Nadwormy spent several days in Sitka. The Raven Radio Post-Graduate Fellowship in Community Journalism was created to honor the memory of Steve Will. 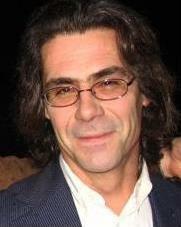 Steve worked in different capacities at Raven Radio over a period of about twenty-five years. Like many of us who have made careers in public broadcasting, he began as volunteer and, the story goes, he wasn’t all that good at first. Steve finally did find his groove in the news department, eventually becoming its director. 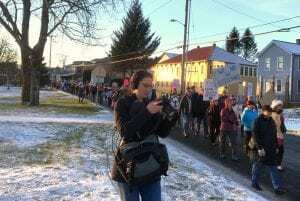 His years in that job were marked by a major labor dispute at the town’s largest employer, the Alaska Pulp Corporation mill, and then the eventual shutdown of the mill itself. Despite the deep divisions in the community Steve’s reporting is still remembered as honest, even, and compelling. He went on to win one of the most prestigious national awards in broadcasting – the Ohio State – for a series he produced during that period on the sexual abuse of minors. Steve later was detailed voluntarily to serve as a regional reporter, in an experiment that shaped the present-day CoastAlaska Network. He left broadcasting for a while to write for the Daily Sitka Sentinel, but returned in 2006 as Raven Radio’s program director. Steve’s death in a bike accident in 2007 in no way canonized him. His reputation as committed journalist and passionate advocate for community broadcasting was well-established, well-deserved, and well-earned. PreviousCan a cellist change the world?